If you follow me on Instagram, you know that earlier this month, I attended Alt Summit for the first time. If you don't know what that is, it's a blog/digital/creative conference held in Salt Lake City twice each year. The trip was very last minute (I actually won a ticket via an Instagram contest! ), but I'm so glad I went. I learned so much, attended some amazing seminars, and best of all, met a lot of really cool people. 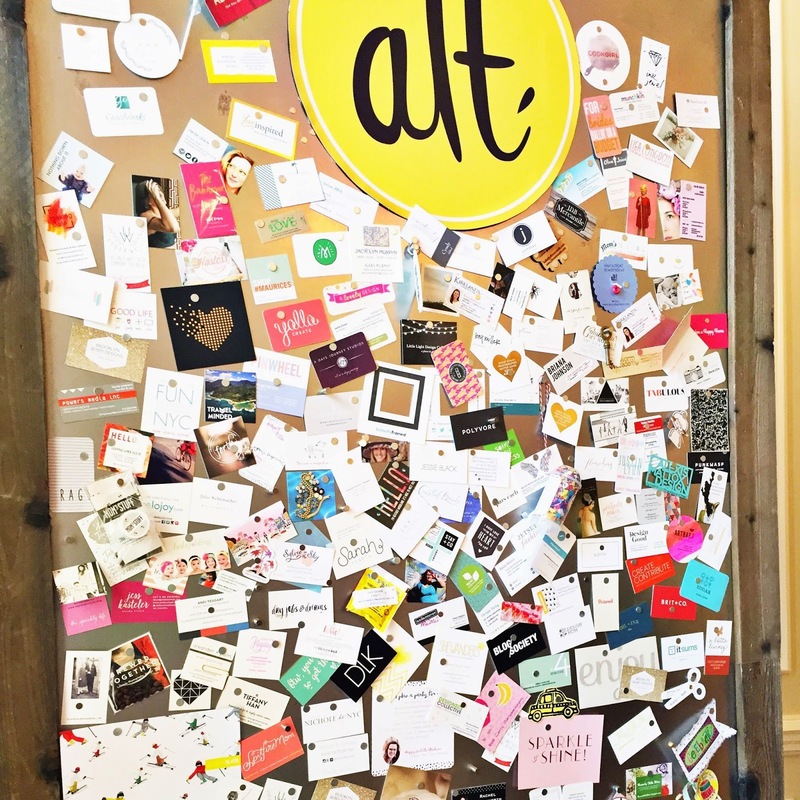 Since Alt is attended primarily by creatives, it's become famous for its inventive business cards. People really bring their A-game when designing these things and there are so many cool ones! Since I've been home, I've been pouring through my card collection, checking out everyone's site. There are so many great ones, so I thought it would be fun to share them with you. So here we go: Here's 45 of the people I met at Alt and their amazing online worlds. A Bubbly Life: Laurel's crafting blog is really cool! She has fun, very different DIYs like this how-to for making GLITTER PILLS. I do not need a glitter pill in my life, but now I so want a glitter pill in my life. A Girl Named PJ: PJ is actually a real-life friend of mine who I knew before the conference. (We met through blogging, though!) She runs a great lifestyle blog that is a daily read for me. PJ is a bit of an Alt veteran, so she knew lots of people there and was great about introducing me. Thanks for letting me tag along, PJ! Alexis June Weddings: Brandi is a talented NYC-based wedding photographer and one cool chick. We had never met before Alt, but she drove me to the (gorgeous!) mall the first day so that I could buy some hair spray, so for that I will be forever grateful. We also had an awesome chat over lattes that afternoon, and I can't wait to hang out (and hopefully collaborate!) with her now that we're back in NYC. A Ruffed Life: Alix is a talented crafting/party blogger who taught a great, helpful roundtable on working with brands. Barefoot Contessa Boutique: I sat by Eva in one of the breakout sessions. She runs a string of clothing boutiques in Canada, and also has a blog. Bree Johnson: Bree and I actually never met! You see, the last night, there was a series of bulletin boards where you could leave some of your business cards and take some others. Bree's card stood out to me because of the cool gold-foil printing and the fact the she referred to herself as a "Glitter Lover." Her blog has DIY, her own (wonderful!) photography, and more. Confetti Sunshine: Sara is an SLC local who very sweetly gave me a ride to an off-site dinner the first night. Her blog is a great collection of DIYs and crafts, not to mention the most beautifully bright, airy photos. Design For Mankind: I met Erin the first night and didn't realize at first that she was who she was. (She's a big, super successful blogger, BTW!) After bonding over beauty products and babies over dinner, we shared an Uber back to the hotel. I'm not usually one to say that someone has "great energy," but well, Erin has great energy! So nice, so genuine. Fabric Paper Glue: If you love DIY and crafting, you'll love this! Mandy also offers craft parties in Nashville, which look so fun and make me wish I lived in Nashville. Forever Heyday: Amanda has her own design and letterpress studio and her work is beautiful. Be sure to check out her Etsy shop where she sells cards and other designs like this cool alternative to a guest book. From Rain To Shine: Jess is an L.A.-based graphic designer who also has a cool lifestyle blog. I really like her weekly link roundups. Good Dogs & Co.: I met Lucy the last night at a party. She runs a blog with tips, reviews, gear, and more--all revolving around canines. I need to start following it because my dog is batshit crazy. I Heart Cleveland: Charity and I met while taking headshots! (More on that below...) Her lifestyle blog covers design, style, food, and more in Cleveland and beyond. I Heart Naptime: Oh yeah? Well, I heart your blog name. I sat next to Jamielyn in an (amazing) Pinterest Analytics roundtable and I'm so glad I did. Her site is full of lots of fun recipes, crafts, DIY, and more. Instantly Framed: I met the ladies of this new company at a roundtable on working with brands. I'm excited to try out their iPhone app, which allows you to quickly and easily frame your photos. Izzy Hudgins and French Knot Studios: Izzy is a Savannah-based photographer who partnered with stylist Audrey to take headshots of attendees at the conference. I haven't gotten my photos back yet but the ones I peeked at on Izzy's camera are amazing. Oh and both of them are super sweet. Jess Lively: I was SO excited when I found out Jess was going to be at Alt, because I am a huge fan of her podcast, The Lively Show. So I was having a huge fangirl moment sitting there in her (awesome, super inspiring) roundtable on podcasting. I also had a chance to spend some time chatting with her one-on-one at a party that night and she is so sweet. Jessie Black: Jessie is an Australian who I had such a nice time talking to at the Downton Abbey-themed party the second night of the conference. Mugs Buckley of Chairish (who is amazing and is one of my favorite people I met the entire time, BTW) was part of the convo, too, and revealed that Jessie has the most amazing lifestyle store in San Fran selling to-die-for cashmere. I can't wait to get to the Bay Area so that I can check it out! Legal Miss Sunshine: I picked up Andrea's card at the creative and awesome cactus-themed party she threw the last night. Her beautiful lifestyle blog covers recipes, parties, travel, and more. Megan Tsang Studio: Megan is a supernice wedding photographer who I sat with at lunch one day. Love her work! Modern Patina: I sat next to Sarah one day at lunch, and learned that she is just starting a blog, so she is just getting started in this journey. Best of luck, Sarah! Can't wait to see what you come up with. Sarah Hearts: Sarah was so lovely and sweet! And her brilliant DIY blog is just as cool as she is. Style & Pepper: Okay, I knew Jessie (a.k.a. style blogger extraordinaire) beforehand (Hoboken, represent! ), but it was great seeing her at Alt and sitting in on the awesome class she taught with Hilary Rushford about monetization. Oleander + Palm: Recipes, DIY, home decor--Jeran's blog embraces breezy, California-living at its finest. Our Style Stories: Hilary co-taught that amazing podcast session, and I've been listening to her great show ever since. She interviews tastemakers and stylish people about their lives and it's very cool. Pars Caeli: I met MJ the first night and I ran into her smiling, friendly self many times throughout the conference. Her great-looking blog is packed with crafts, recipes, blogging tips, and more. Petit Elefant: Allison runs this online parenting magazine, which covers style, travel, beauty, family, etc. Rachel Swartley: Rachel's lifestyle blog focuses on crafting, family, food, and more. She's also a mom of three (I bow down to her) and had super cute, hexagon-shaped business cards. Rad Mom Cool Kid: Here's another one that I plucked from the leave one/take one bulletin board. The blog's name caught my eye, and now I'm loving checking out all the posts on family, style, travel, and more. Trisha Zemp: Trisha is a talented Utah-based photographer, who shoots for many huge blogs such as The House That Lars Built and Oh Happy Day. She won for my #1 favorite business card of the event, too: It's a thick, beautiful, stop-motion animation flip book! She is currently mulling over coming to NYC for the summer for an internship and I spent a lot of time trying to convince her. Because I thought it was a good, smart move, for sure. But also because I desperately want her to shoot for this blog! The Bannerie: How cool are Gilit's glitter banners? Love! I so want a custom one that says "The Sparkly Life" and I also officially need one for every single one of my daughter's parties going forward! The Crafted Life: Rachel is so nice! We bonded over the fact that we both have "The...Life" blogs. Hers is crafting focused though (obvs) and has lots of great DIYs and beautiful photos. The Creativity Exchange: I sat behind Cyndy at the Pinterest roundtable and she graciously let me take a photo of her handout since they had run out. If you love DIYs, designs, and food, her blog is a great resource--there's tons of stuff! The Road to The Good Life: Eden does social media for Alt (and also has her own lifestyle blog), so we've been connecting online for months now. It was so great to finally meet her in person and to get a chance to chat when we sat next to each other at lunch the last day. The Roc Shop: I picked this card up at a party, so we never actually met, but I'm so glad I did. Her party supplies (cake toppers, swizzle sticks, etc) are really cool, and I totally need some of her stuff for my daughter's upcoming party which I am in mad planning mode for right now. Velojoy: Susi's site is specifically about cycling in NYC. It's a great resource and I love how specific her niche is! Wit Wisdom & Food: Anne and I were in the podcast roundtable together, too. She runs a recipe, decorating, and DIY blog with lots of great stuff. And her blog name is kind of amazing, no? Are you fans of any of these blogs already? Do tell! Note: If we met and you're not on this list, it means I lost your card somehow! So please comment below or email me, and I'll add you to the list! This is such a nice way to round up the Alt experience! Your blog is lovely, sad I didn't meet you! Thank you so much for including me! I'm so glad we finally got to meet in person! LOVE this! I am always looking for new blogs to follow! Wow, you are so awesome to do this with so many cards and links! Thank you for including me and it was so great to meet you! !